When I was a kid, I grew up reading a staple of investigative and mystery books - think Enid Blyton's The Secret Seven and Famous Five. The wifey also loved those titles, along with a healthy dose of Nancy Drew as well. Though deeply intriguing, the problem with these detective-mystery books was that all the books were written by foreign authors with the stories being set against a foreign land. So it was often a challenge to identify with some of the places that the stories had described, not to mention some of the lingo which the books sometimes use. I haven't introduced Ash & Ayd to the books that the wifey and I used to love while growing up, but I suspect they would always love a good detective novel or two. 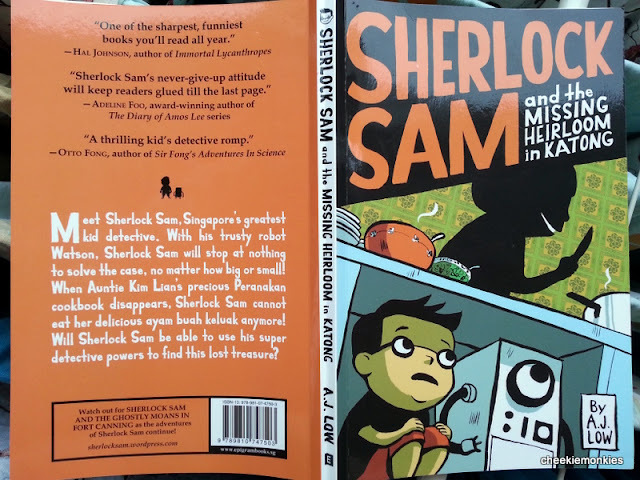 So it was a good thing that the kind people at Epigram Books sent us their first book of a new children's series titled Sherlock Sam and the Missing Heirloom in Katong. And here is the synopsis. 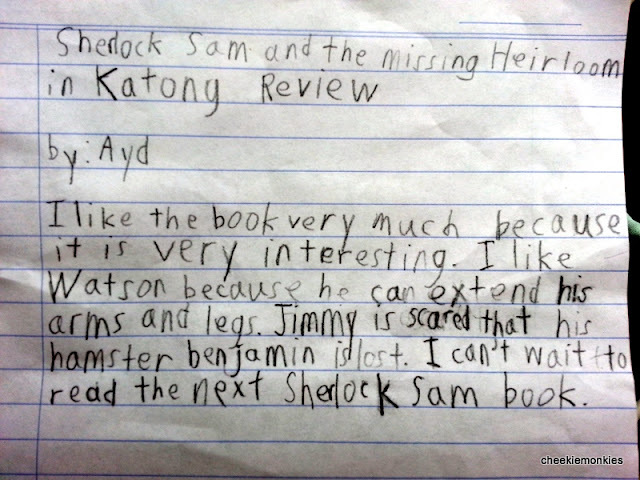 Meet Sherlock Sam, Singapore’s greatest kid detective. With his trusty robot Watson, Sherlock Sam will stop at nothing to solve the case, no matter how big or small! In Sherlock Sam and the Missing Heirloom in Katong, Auntie Kim Lian’s precious Peranakan cookbook disappears, and Sherlock Sam cannot eat her delicious ayam buah keluak anymore! Will Sherlock Sam be able to use his super detective powers to find this lost treasure? Katong, Peranakan, ayam buah keluak... How Singaporean can you get? The intrigue of Cher Lock - but he would rather be known as Sherlock - begins when Auntie Kim Lian, an elder Peranakan, lost her one family heirloom - a precious book of Nonya dish recipes. Sherlock then jumps at the chance to prove his sleuth skills: "This was a mystery I was determined to solve!" he proclaims. And what is a mystery novel without a sidekick? Enter Watson, a clever robot invention created by Sherlock who seems to derive great joy in reminding everyone how much Sherlock loves to eat and fart. Oh and in case you are wondering, Watson’s name wasn't named after the character from Sherlock Holmes. In fact, his name was a result of a hilarious accident - which made both my boys laugh out loud - but I’ll leave that for you to find out of course. The original idea was to have either Ash or Ayd read the book first, with the other one then having his turn after the first one was done with the book. What happened in the end was BOTH boys were clamouring to read the book first, so I was left with no choice but to read the book TOGETHER with the both of them. Yes, the three of us sharing one book. But it was a good thing I did that. Because I found it to be utterly captivating enough to make me want to complete the book in one sitting. Unfortunately though, it was the boys' bedtime book of the week so they forbade me to finish reading it without them. We eventually finished the book over 4 nights, with the pace of the boys' reading quickening during the last few chapters... all because they were extremely eager to find out the whodunnit ending. In the end, the shenanigans sounded innocent enough, but the localized dialogue is hilariously tongue-in-cheek and the book's subtle appeal to a child's instinct for the mysterious proved to be just what kept both Ash and Ayd deeply intrigued. Ash was feeling lazy so he declined to pen something down. But he did mention to me that his favourite part of the book was when Jimmy, a friend of Sherlock's, went berserk when he lost his hamster and how Sherlock managed to locate the furry creature by means of logical deduction. As for me, I found Sherlock Sam and the Missing Heirloon in Katong to be a rather clever and funny read. It's nothing too tedious for young readers, while exposing them to the Peranakan culture (and yummy food!) at the same time. Now, all the boys (and me) are waiting is for Book 2, titled Sherlock Sam and the Ghostly Moans in Fort Canning, to be out in March!